Yummy! 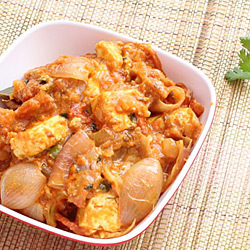 That’s what you would say after eating a first spoonful of this simple and healthy garlic flavored Indian curry. 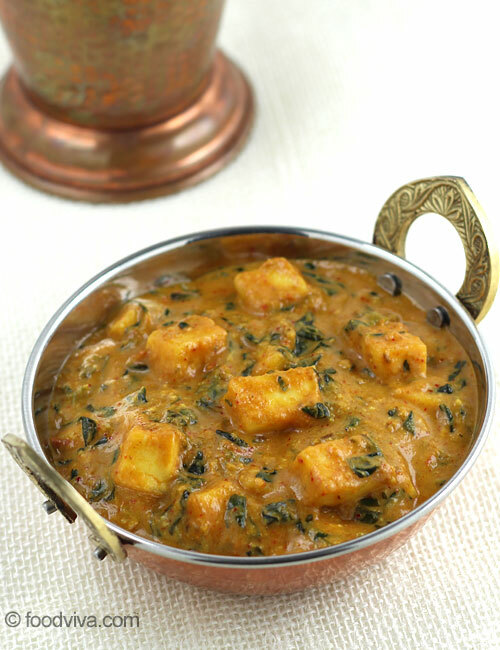 Methi Paneer, one of the best recipes with fenugreek leaves, prepared by this recipe is not only healthy but also has a nice and tasty gravy of cashew-nuts, garlic and onion, whose flavor combines well with fenugreek leaves and paneer, giving it a complex yet rich character. The riot of flavors doesn’t stop here, the addition of milk makes it creamy as well as gives nice subtle flavor. 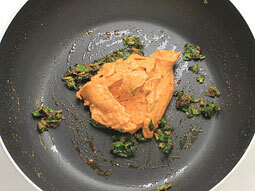 Heat 1-tablespoon oil in a non-stick pan (kadai) over medium flame. Add cumin seeds. 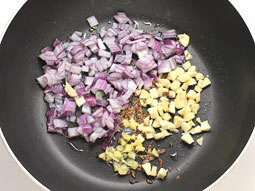 When they start to turn light brown, add finely chopped onion, garlic and ginger. 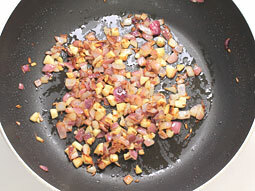 Stir and cook until onion turns light pink. 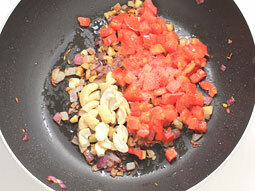 Add chopped tomato, cashew nuts and salt. Sauté until tomatoes turn soft. Transfer the mixture to a medium bowl and let it cool at room temperature for 5-6 minutes. Transfer the mixture to the small chutney jar of a mixer grinder and grind to a smooth paste. Meanwhile, heat 1/2 tablespoon oil in the same pan. Add paneer cubes and stir fry until they turn light golden brown on all sides. Transfer them to a plate. Use non-stick pan to prevent sticking of paneer. Heat 1½ tablespoons oil in the same pan over medium flame. 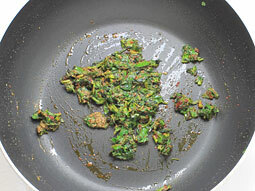 Add chopped methi leaves. Stir and cook for 2-minutes. 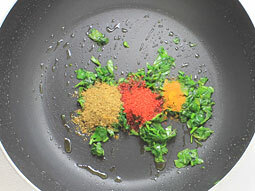 Add red chilli powder, turmeric powder and coriander powder. 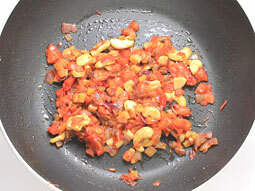 Add onion-tomato-cashew-nut paste (prepared in step-4). Add 3/4 cup water, mix well and cook for 2-minutes. Add shallow fried paneer cubes and 1/4 cup milk. Mix well and cook for around 3-4 minutes or until you get the desired consistency of gravy. Turn off flame and transfer prepared curry to a serving bowl. If you don’t like garlic flavor, add only 1-2 cloves of garlic. If you are using frozen paneer cubes, then soak them in hot water for 10 minutes and drain before using. 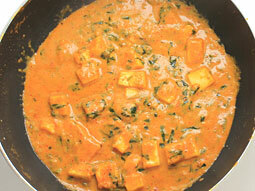 Shallow fried paneer cubes are used in this curry to get richer experience of paneer methi. 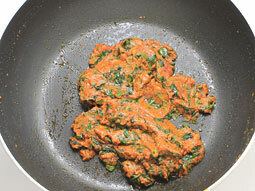 However, you can add paneer cubes without shallow frying. 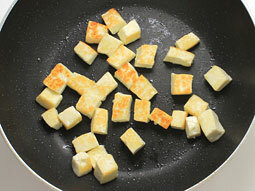 Use non-stick pan to prevent sticking while shallow frying paneer cubes. 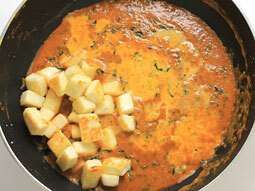 For simple change, use boiled and cubes potatoes in place of paneer. Add 1/3 cup boiled matar (peas) in step-12 to make yet another heavenly and healthy variation. 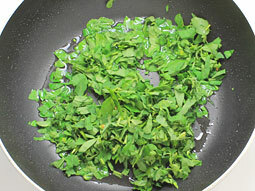 Taste: Mild spicy with nice taste and flavor of garlic with fenugreek leaves. Serving Ideas: Methi paneer masala served with butter naan or tandoori roti, sweet lassi and a masala papad is a scrumptious meal. Very good recipe. Would like to do some tried and tested recipes.Thanks. I'd been searching for Methi Paneer recipe for a long time. The photo looked good but I wasn't too sure as the recipe was too simple. Well, I made it and the taste is simply delicious. Thanks a ton. I get new recipes of Paneer. It's easy and simple too. Loved the paneer methi subzi. Very easy to prepare and tastes awesome. Its very delicious. Loved the dish very much. Easy to cook. Kindly correct the error in Ingredients from 1/4 water to 1/4 milk. Response: Thank you Singh for pointing out the mistake. Corrected the ingredient now. 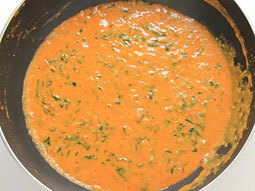 I am a human and I liked methi paneer recipe. It is easy to cook.